Horseback riding is fun and an adventure but it is always important to be as safe as possible when you are riding a horse, because, lets face it, horseback riding is a very dangerous sport. Many accidents can happen and it has resulted in many critical life changing injuries and even deaths. Deaths that could have been avoided if people took the time to consider all their safety rules. Always always always wear a helmet! It’s the same when you’re riding a bike or a motorcycle. A helmet can be the thing that separates life and death in an accident. An honestly, how easy is it to snap on a helmet? Some people don’t like to wear helmets because they don’t look cool, well, looking cool for about an hour or so a day isn’t worth a life. So, always wear that helmet. I don’t think many people think about this, but it is also quiet important to have a riding buddy. They don’t necessarily have to be riding a horse when you are, but get someone who will watch you or just sit around by you while you ride, in case you get seriously hurt. Because believe me you do not want to be alone if you fall of a horse and break you leg, or your neck! A buddy could help out a lot; calling 911 on your PLATEAU Cell phone immediately, making sure the horse doesn’t step on you, making sure you don’t hurt yourself more, etc. Don’t count on other people being around doing stuff around the stables, always invite a buddy. Make sure the horses attitude is normal that day. If the horse is acting a little grumpy and fights with you on the reins or saddle more that it usually does, don’t ride that day. Just let the horse run around in an arena and blow off some steam. Chances are after he has a little free running time when he doesn’t have to carry someone on his back he’ll be in a lot better mood for the next days ride. Make sure when you put the saddle on, it is on tight and it is on right. That’s a simple safety rule. Safe Saddle! Make sure the weather isn’t bad. If it is really hot out you need to be extremely aware at how you’re feeling while you’re riding. If you feel dehydrated, and feel like you might faint, get off the horse! And you obviously don’t want to ride when it’s raining, the horse could accidentally slip and then you’d both be in trouble! He could end up with a broken leg; you could end up with a broken back! · When learning to ride, start off in a small area with an experienced person to help you and as you progress and get more comfortable with your riding and the horse, you can start riding in larger and larger areas. · Ride a suitable horse for your riding skill level. 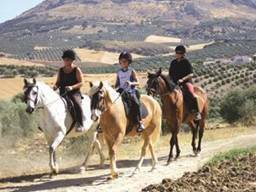 · The safest way to learn to ride is with an experienced riding instructor or coach. · Know the proper way to saddle your horse to prevent you saddle from getting torn up or the horse injured if he gets spooked. · Always secure your front cinch first, then the back cinch, and finally your breast collar. · Wear an ASTM approved riding helmet. Numerous agencies and safety committees cite that the majority of rider fatalities are due to head injuries. · Wear sturdy boots with minimal tread and a 1 inch (2.5 cm) heel. Alternatively use safety Stirrups or cages. If you fall you could be dragged if your foot slips through a stirrup. · Always ride in complete control. As with cars or bikes, the faster you go the faster things can go wrong. · Leave a map of your route when riding out on trail and the approximate time you will return. That way the folks back home will know when to start worrying and where to look if you are overdue. · Always ride out with a buddy. As an extra precaution carry a cell phone or two-way radio. · In a group ride the speed of the least experienced rider. For many people riding out on trail is the only way to ride. But even if your goal is the show ring, trail riding can provide a welcome break in routine from working in an arena for both horse and rider. Trail riding requires a little more awareness. Situations can occur that would never happen in the more controlled environment of the riding ring. Following these suggestions may make your trail riding experience safer. Tell someone where you plan to go and how long you will be. Youll be more comfortable if you have snack and drink before you leave, especially if you plan to be out for more than an hour or so. Pack snacks and drinks along if youll be out all afternoon. (Not really a safety issue, but I get light headed if I forget to eat and that takes the fun out of a ride.) Make sure your horse has been fed and watered too. Wear your helmet and proper boots or safety stirrups. Your horse should be calm and traffic safe. Find out before heading out on trail. Ride in a pasture along a road. Invite a dirt bike or ATV driver to ride up and down your driveway. Your horse should be reasonably well schooled and obedient. Your tack should always be sturdy. A broken rein might be a problem in the ring, but it could be a disaster on the trail. If you plan to tie, take along a halter that can be put on over the bridle and a lead rope. Never tie a horse by the reins. Take along a hoof pick, a pocket knife (some people recommend wire cutters), and a small first aid kit if you will be far from help. If you have the technology use it. Cell phones and GPS are handy to have in an emergency. Thick tree foliage might interfere with reception, so a hilltop or open field might have to be found. Of course an old-fashioned map and compass might help too. Ride with awareness. Know where problems might occursuch as a water crossing, passing by a kennel or an unusually painted fence or mailbox. Keep two horse distances apart to avoid kicking. Go the speed of the greenest horse or the most inexperienced rider. Walk up and down steep hills. Avoid riding along roads if possible, especially at peak traffic times or in darkness. Go the same speed. Dont trot or gallop past someone going a slower pace. Warn riders behind you of low branches, stumps, holes or other hazards. Hand signals for horseback riders are the same as for cyclists. Use them to signal riders at the back of the pack and along roads. Ride well-known trails when the light is poor such as nightfall or very early morning. Walk your horse the last half-mile home. This will cool him out and prevent him learning to rush back to the barn. Many riders have access to the growing number of multi-use trails being established. 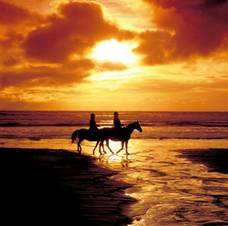 State and provincial parks, private trails, and rail trails are ideal for horseback riding. Unfortunately, in some areas, horses are not welcome, largely due to misunderstandings between users. Courtesy and a little extra care can help leave a favorable impression of horseback riders. Here are a few ideas that can help keep all users safe and happy. Dont canter, lope or gallop unless you can see well ahead of you that the trail is clear of other users. Walk around corners, bends and across trail junctions. Walk single file past other trail users. Be aware of how repeated horse traffic can cause erosion over time. Spread out on hills instead of making a deep single track. Be aware of how hooves may damage surfaced trails. Ride slowly or move off to the side. Always, whether on the trail or in the ring wear your helmet and safe footwear or use safety stirrups. Ride a horse that is trail wise. Before heading out on trail make sure your horse is accustomed to pedestrians, bicycles, ATVs, dirt bikes and any other traffic you may encounter. Take the initiative to move off the trail, especially for pedestrians. Many people are intimidated by horses. If your horse is startled by the sudden appearance of another trail user politely ask them to say hello so your horse can recognize them as another human. Not everyone takes horse manure for granted like horse lovers do. If your horse drops manure on the trail, get off and clear it off the track. Trails in some areas have been closed to horses for fear of contamination. Once exposed to the sun, horse manure has little in it to contaminate ground water. Even if you fall face first in a fresh pile, its unlikely youd pick up any harmful bacteria. However, dont expect non-horse people to know that. Clean up after your horse in the parking lot if youve trailered in. Dont leave manure, urine puddles, or old hay lying about. Bring a muck bucket and a manure fork to clean up with. Wash away urine with a few buckets of water. Dirt bikes, ATVs and other motorized vehicles may be encountered on some multi-use trails. If you are riding in an area where you will meet these users try to stay out of their way. Better yet, try and establish an understanding between vehicle users and horseback riders so both can enjoy the trail safely. This might require a little more time on your part, but it will be worth it if unfortunate encounters or accidents can be avoided. Always, always be polite, even if someone is impolite to you. Do everything you can to leave other users with a favorable impression of horseback riders. 1. If you plan to ride alone, tell someone where you are going and about when you expect to return.2. Ride a well-mannered horse.3. Do not play practical jokes and indulge in horseplay.4. Watch were you ride-avoid dangerous ground. Note landmarks. Study the country and view behind you so you will know how it looks.5. Courtesy is the best safety on the trail. 6. Think of your horse first. Watch its condition, avoid injuries, and care for it properly. 7. Carry a good pocket knife to cut ropes, etc., in case of entanglement. 8. Don’t tie the reins together. 9. Ride balanced and erect to avoid tiring the horse or creating sore backs, legs, etc. 10. Check the equipment: – Have a halter and rope. Hobbles are fine if the horse is trained to them. – Have clean saddle blankets or pads. – Be certain the equipment is in good repair and fits the horse. – Include bad-weather clothing. – A pair of wire cutters is handy in case the horse becomes entangled in wire. – A lariat is handy for many needs, but know how to use one and be certain the horse in accustomed to a rope. – Extras should include pieces of leather or rawhide for repairs; a few spare horseshoe nails; and a few matches. 11. If you unsaddle, store your gear properly and place the saddle blanket where it will dry. 12. Don’t water your horse when it is hot. Cool it first. 13. Always tie a horse in a safe place. Use the halter rope-not the bridle reins. Tie a safe distance from other horses and from tree limbs or brush where the horse may become entangled. Never tie below the level of the horse’s withers. Be certain to tie to an object that is strong and secure to avoid danger of breaking or coming loose if the horse pulls back. 14. Be extremely cautious of cigarettes, matches, and fires. Know they are out before discarding them or leaving. 15. Obtain current, accurate maps and information on the area. Become familiar with the terrain and climate. 16. If you ride on Federal or State lands, seek advice from the forest or park officials. Know their regulations on use of the trails and fire. 17. Be certain the horse is in good physical condition and its hooves and shoes are ready for the trail. 18. Use extreme caution at wet spots or boggy places. 19. Speed on the trail is unsafe. Ride at safe gaits. 20. Avoid overhanging limbs. Warn the rider behind you if you encounter one. Watch the rider ahead so a limb pushed aside doesn’t snap back and slap your horse in the face. Your horse must be traffic safe before heading out on trail or along roads. Always assume you could meet dirt bikes, ATVs and 4X4s, cars or trucks when riding out of an enclosed area. Plan to ride in off-peak traffic times. Avoid riding in poor light along roads. Know the traffic regulations in your area regarding horses. Most often horses must travel with the traffic. Try to stay well off the roadside, but watch for hazards in ditches and verges such as broken glass and holes. Stay together. Cross roads as a group so no one is left behind. Be courteous to drivers, especially those who have made a special effort to get around you safely. Hand signals for horseback riders are the same as for cyclists along roads. Stay off pavement if possible. Some road surfaces are like ice to a horse. Exercise caution in these simple ways and you’ll ensure your horse riding safety and also enjoy your horse riding experience as well. 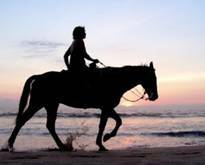 This entry was posted in General and tagged horse, horseback, Riding, Safety, Tips. Bookmark the permalink. Ken Oswald, who is a very frequent contributor to my safety blog, is the one who put all this together so he must get the credit. I’m glad that we can help contribute. Please feel free to use this information any way you want in order to ensure a safer and more enjoyable horseback riding recreation.